Got drama in your workplace? Gossip? Tattling? Employees constantly complaining about a colleague’s poor communication skills? Are you spending an inordinate amount of time dealing with unproductive behaviors like jealousy or resistance to change? If it seems like hours every day, you’re not wrong, and you’re not alone. Cy Wakeman, researcher and New York Times bestselling author, has determined that employees spend nearly 2.5 hours a day – more than 17 hours a week, or 68 hours a month (816 hours a year!) – on negative behavior that results in drama in the workplace. And for the average business, that can add up to millions of dollars in wasted time and energy. Think about it: What if you could recapture those 816 hours a year, PER EMPLOYEE, and put that energy back into improved customer experience or a new revenue stream? Wakeman believes there are millions of dollars’ worth of potential for the average organization. Wakeman’s research finds that ego issues – behaviors where a scorekeeper mentality and/or judgment are the culprits – are the greatest source of wasted time (30 percent) for employees and management. 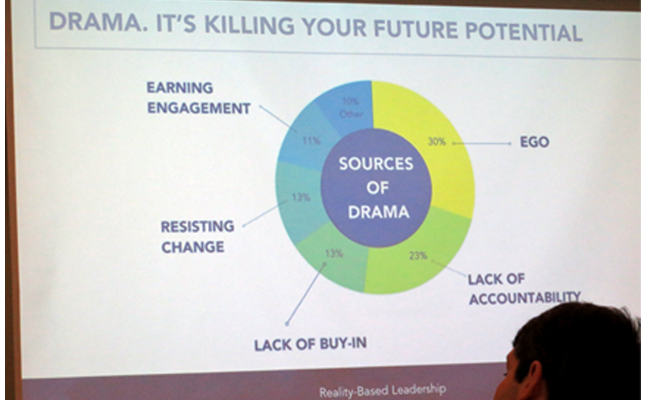 Other drama offenders that can drain your business’ potential are lack of accountability (23 percent) and resistance to change (13 percent). stop feeding into the drama. The day was full of valuable takeaways. Here’s what two VACEOs members had to say about their experience. “… I left Cy’s talk no longer preoccupied with obstacles; I left focused on opportunities.” – Charlie Connell, Principal, Punch. 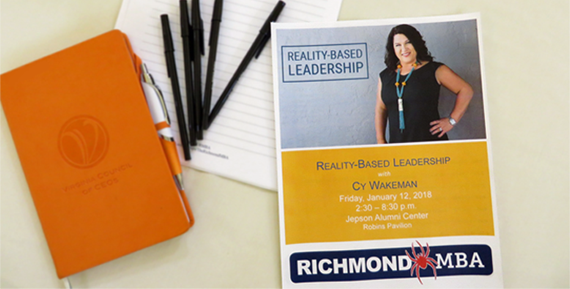 “Cy Wakeman’s ‘Reality-Based Leadership’ presentation is yet another example of a great educational opportunity I gained access to through my participation in the Council. I walked into the talk preoccupied with work, but it didn’t take her long to grab my attention. ‘I’m not responsible for the happiness of my coworkers’? ‘You can’t purchase buy-in’? These are things you know are true, but you still want the happiness and the buy-in. Cy explained other ways of thinking about these statements that made sense. My favorite takeaway was combating ‘Why Can’t We’ statements with a ‘What If We Could?’ mindset. Again, a simple concept, but delivered in a way that was impactful for me. The segment about accountability and the fact that it cannot be enforced – it’s something that must be chosen – also hit home for me. All in all, I left Cy’s talk no longer preoccupied with obstacles; I left focused on opportunities,” says Charlie Connell, Principal, Punch. “I was delighted to attend the presentation by Cy Wakeman! Aside from providing a straightforward, common-sense approach to workplace issues, she offered humor and personal examples. It’s frequently challenging to step away from daily operations, so I like to consider that my time is well spent. VACEOs offers these kinds of opportunities. 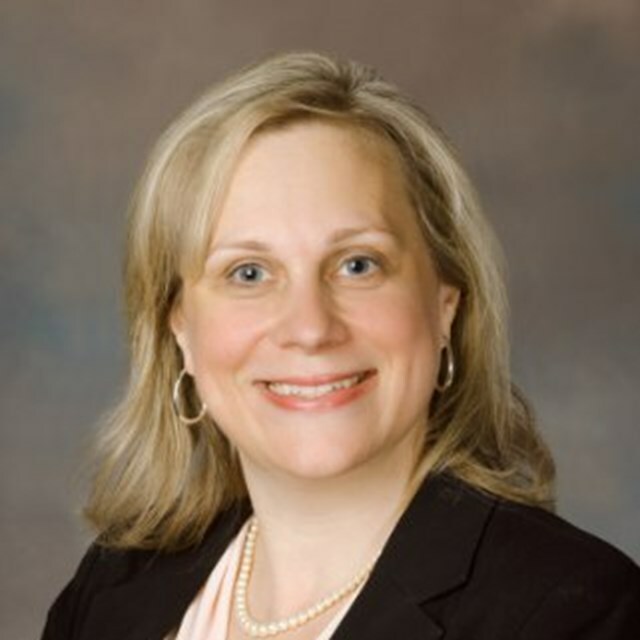 The learning opportunities that are offered through VACEOs have been invaluable for my professional and personal growth,” – Jennifer Boyden, Chief Executive Officer, Heart Havens. Do you have a thirst for knowledge that will help you grow your business? Do you need inspiration to help you get “unstuck”? VACEOs can help you work ON your business – not just in it. Our members are regularly exposed to inspiring presentations by local and national thought leaders. Topics range from management techniques to trends in technology and marketing, and much more. Next up? 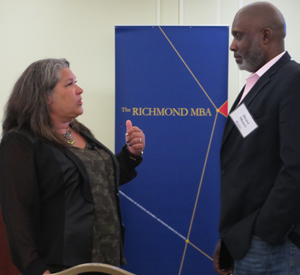 “Future-Proofing Your Career” – a special knowledge-sharing and networking event for women co-sponsored the Robins School of Business, a VACEOs sponsor. Become a member today – or contact us about attending an event as a guest. 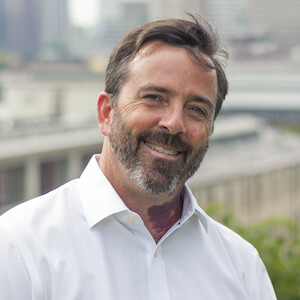 Cy Wakeman is a dynamic international keynote speaker, business consultant, New York Times bestselling author, and global thought leader with more than 25 years’ experience cultivating a revolutionary new approach to leadership. Grounded in reality, Wakeman’s philosophy has helped organizations and individuals all over the world learn to ditch the drama and turn excuses into results. Learn more.